Watch a dog when it first gets up from a nap. Their front paws extend forward, chest lowers, and they lift up and back through their rear end. This dog stretch is imitated in one of the quintessential poses of yoga: Downward Facing Dog, or Adho Mukha Svanasana (hereafter referred to as AMS). 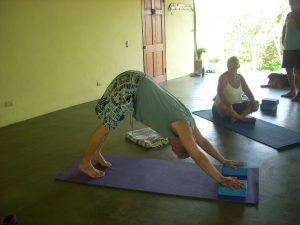 AMS is such an integral part of a yoga practice because it is so great for our whole body. The pose builds strength and flexibility in our arms and legs, shoulders and our back body. Once we have been doing yoga for a while, it can be both a resting pose between a flow practice, and it can also be an invigorating pose, helping us to come into the vitality and extension of our body and mind. For beginners or those with a lot of tension or tightness in their shoulders, hamstrings, and low back, this pose can be difficult! So remember to balance effort and ease, and find a variation that helps your body in the best way. If this is you, using a chair or a wall can help you get the benefits and openings of this pose without having to strain or create injury. As your body becomes more flexible, doing this pose with bricks is a good transition before going all the way down to the floor. 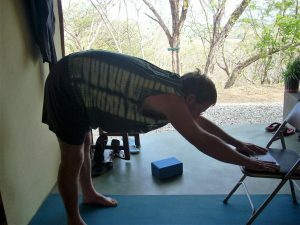 AMS, when done using a wall or your desk can be a great way to take a break from your computer, releasing tension from your neck and shoulders. For the classic AMS pose, begin in child’s pose, with your sitting bones on your heels, arms reaching as far forward as possible, shoulder’s width apart. Come onto your hands and knees, with your knees and feet hip-width apart. Inhale and curl your toes under, exhale and lift up through your sitting bones, straightening your legs and also creating a straight line from your hands to your hips. If your hamstrings are tight, you will need to modify this pose to begin with. You will notice this because the back of your legs and/or low back will be screaming, and you will not be able to keep a straight line from your hands to your hips: your shoulders will be more on top of your wrists and your pelvis will not be in an anterior tilt, but will be trying to tuck under. 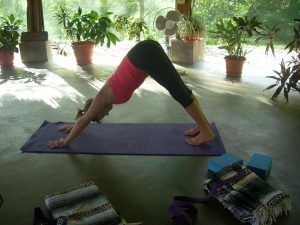 So first and foremost, make sure that you are mindfully working with the back of your legs to open and lengthen (that can be a whole other post in this series). For now, use either a wall, a chair, or blocks to get your hands higher so that you can open the back of your legs and not feel an unpleasant amount of weight bearing in your wrists or screaming from your hamstrings. At times I see students who do not want to use props and will continue to bend their knees in order to do this pose with their hands on the floor. While this can get you through a flow class without have to continually move your props on and off your mat, do your work on this pose with props outside of class, please! In fine-tuning this pose, first press down evenly through your hands and feet, even if your heels do not go all the way to your mat. Press the pads of your fingers and thumbs into the mat. Press down also into the base of the fingers and thumbs, especially at the base of the thumbs and first fingers, while you lift from this inner edge of your hands up and into your inner armpit. Wrap the upper arms (deltoids) and outer armpits down. Press your shins and thighs back to lengthen the sides of your waist. Lift from the back of your knees up to help lift and spread your sitting bones, while you also reach from the back of your knee down to your inner heels. Let your head be in line with your spine between your arms, and keep moving your shoulder blades towards your waist. Enjoy the energizing and the calming effects of this pose!